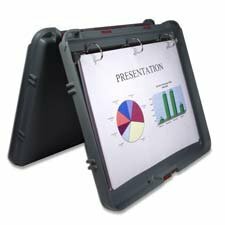 Portable presentation desktop contains an internal D-style, three-ring binder with a 1" capacity. Patent-pending locking spine allows the desktop to set up as an easel stand. Strong low-profile clip with rubber grips holds up to 1/2" paper. Reversible internal clip holds documents, business cards and writing instruments. Snap closure keeps materials safe from weather. Portable desktop is made of durable polypropylene construction.